63% of American adults are overweight, and now 1 in 3 children are overweight or obese. 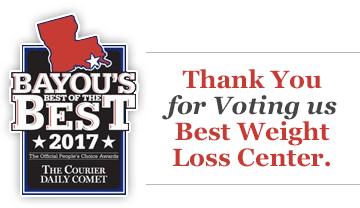 The Aspen Clinic has been helping Louisiana lose weight through nutrition and weight management for 30 years and now we’ve opened our doors to kids too. Aspen for Kids! is an adolescent weight management program we have developed to help children (ages 7-17) and their families learn to make healthier choices, incorporate physical activity, and live healthier lives. In Louisiana, you can find plenty of nice people, jazz music, and Cajun and Creole cooking, but beneath its Southern charm, Louisiana also bears the nation’s highest childhood obesity rate. First, the parents of the child will meet with the weight loss specialist separately, where they will explain expectations and goals of the program for the child and the parents. We will go over detailed information regarding lifestyle changes, food journals, eating do’s and do not’s, and other program components. The weight loss specialist then meets with both parents and child to complete a general exam and go over program expectations such as how to eat healthier, log food intake, and plan the next week’s meals. Every 4-6 weeks, each family meets individually with behavior coaches for a longer session to discuss progress as well as support for any specific obstacles or concerns. First, each child is privately weighed and measured. They receive feedback on their progress in changing or maintaining habits over the past 4-6 week period. Second, children and parents divide into separate groups. They discuss specific child and parent experiences and problem-solving techniques. Last, parents and children meet together with a counselor to privately identify obstacles and develop solutions to reach their weekly goals. Every week, each family meets with behavior coaches to discuss progress, concerns, and plan for the next week. Each child is privately weighed and measured. They receive feedback on their progress in changing or maintaining habits over the past week. Parents and child will present food journals to be reviewed, where successes and failures will be confronted in order to continue progress. Goals for the next week will be discussed and recorded, along with meal suggestions for the week. Finally, the maintenance phase of the program helps families practice and reinforce the healthy skills they have learned. It also helps in dealing with difficult situations (e.g., family gatherings, holidays, parties). Families are asked to attend maintenance sessions every 4 months. Does your family need to make a lifestyle change? Aspen For Kids! is now available at our Baton Rouge and Metairie locations. Call today to set up a consultation!